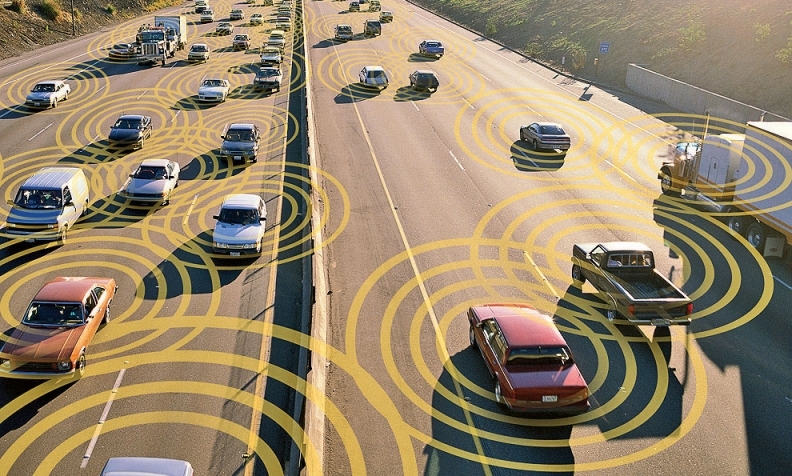 Qualcomm has developed a chipset to allow cars to communicate with their surroundings. Using 4G and upcoming 5G cellular technology, the Qualcomm 9150 C-V2X chipset enables cars to connect to other vehicles, infrastructure and pedestrians, improving active safety and driver assist systems, the chipmaker said Friday. The chipset is slated for commercial sampling in the second half of 2018 and expected to be in production vehicles by 2019. Audi and PSA Group have signed on to test the new technology. "Wireless sensors will have a very important role to play in car of the future," Nakul Duggal, vice president of product management for Qualcomm, told Automotive News a sister publication of Automotive News Europe. "What we are announcing is our first standalone V2X platform." Qualcomm's chips can be installed directly into a vehicle's wireless modem, which allow cars to connect to cellular and wireless networks. However, the chip does not require a mobile network provider, like Verizon or AT&T, or SIM card to work. Rather, the chip uses the 5.9 GHz spectrum -- a radio frequency the Federal Communications Commission designated as the standard for dedicated short range communication systems among vehicles -- to connect to smart infrastructure, other cars equipped with similar technology or pedestrians with mobile phones. With the ability to communicate with their surrounding environment, cars can detect pedestrians outside of the line of the driver's sight, increase driving predictability by signaling intent to other cars and alert drivers of upcoming situations, like a major traffic jam. Current 4G LTE cellular technology allows the chip to communicate basic safety functions, like traffic detection, while upcoming 5G LTE technology, which can handle larger amounts of data and prioritize various communications, will enable more sophisticated operations, like truck platooning, Duggal said. "All of these things are possible because the underlying radio technology has developed much better techniques," he said. "We're much more aligned for V2X with what has been done recently with LTE."